I think I might actually be part Labrador. I am a water lover with a happy-go-lucky personality that is always excited to explore, play ball, take naps, and eat treats! Before my human siblings came along, my first siblings were a litter of black lab puppies. My parents did field trial competitions with our dogs, so from day one I was in a backpack and out on the trail with the pups. 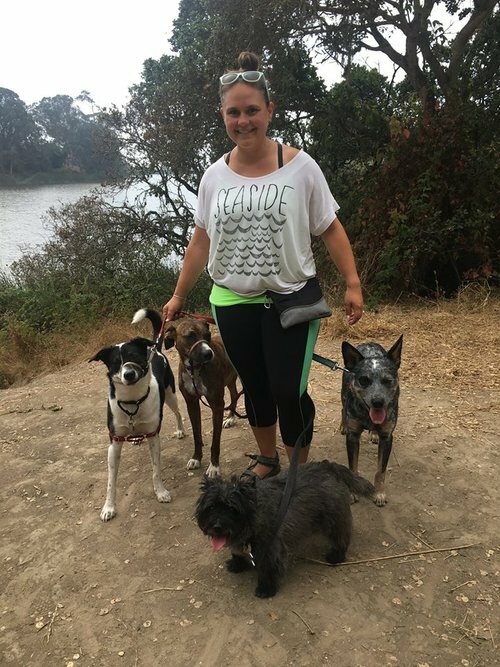 This job is second nature to me and there is nowhere else I’d rather be than out exploring all that beauty Santa Cruz has to offer with my furry friends. I moved to Santa Cruz in 2004 to attend UCSC and studied art and marine science. I now have my graduate degree in Science Illustration and run my own business as a freelance science illustrator and designer. Even after 13 years, I am still in awe that I can find new trails and places to explore! When I’m not on the trail, you can find me scuba diving, surfing, painting, playing with my dog at the beach, or manning the BBQ!